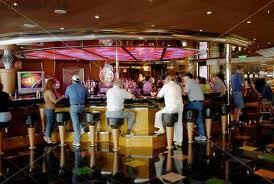 Taking a cruise makes travelers more likely to hit the bottle, according to a survey conducted in Britain. Cruise comparison site CruiseCompare.co.uk asked nearly 1,200 respondents about their drinking habits at sea compared to vacations on dry land, and found that the majority said that they quaff more aboard. In results released last week, more than three quarters of respondents said that they drank more alcohol on a cruising holiday compared to a vacation on dry land, compared to 13 percent who claimed their consumption was roughly equal. A whopping 44 percent of respondents, the majority, admitted to knocking back between five and eight alcoholic beverages a day on a cruise, while 13 percent said that they would drink even more than that. Interestingly, a third of those that admitted to drinking more at sea than on dry land said that the reason they did was because they “felt safer” on a cruise ship – despite the fact that FBI statistics suggest that alcohol plays a role in a significant number of crimes it investigates on board cruise ships.